Coming from the south, take Ritchie Highway (MD 2) north, pass Earleigh Heights Fire Station, turn left (west) on East-West Blvd. at light opposite the Maci Service station, turn right (north) on Jumpers Hole Road at the traffic circle, turn left at the next intersection on West Pasadena Rd., and turn right on Brookwood Road. 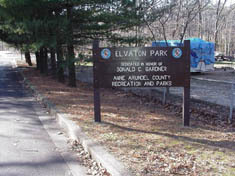 Turn left almost immediately on Dogwood Rd, and look for Elvaton Park driveway (brown sign) on your left. There is a fair amount of cat briar or green briar (Smilax) growing here, which makes walking difficult, but this whole headwaters area is a fairly undisturbed forested wetland. 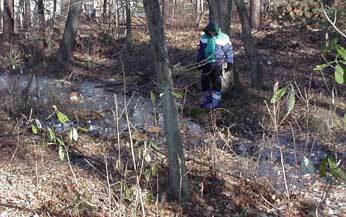 The water flows to the left as you walk into the woods, so you are more likely to see water if you bear left. Notice the large trees, including tulip, poplar, and the buttressing at their bases, which helps to stabilize them on soft wetland soils. Once in the park, park your car on the right in the paved parking spaces, cross the wooden bridge, and on your right is the forested wetland where this branch starts. This wetland is smaller and more open than the one at the western headwaters.